Al-ʿUla (also Al Ola, Arabic العلا al-ʿulā; Also Dedan), is a governorate of Medina Region, and a city in north-western Saudi Arabia. Al-‘Ula was historically located on the Incense route. The city lies within the Governorate of 'Ula (محافظة العلا), one of seven in the Medina Region. 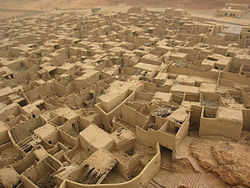 The city is 110 km southwest of Tayma and 300 km north of Medina. The Governorate of 'Ula covers 29,261 square kilometres (11,298 sq mi). The city (municipality) covers 2,391 square kilometres (923 sq mi). The population of the city is 5,426. The walled city of Al ‘Ula was founded in 6th century BC, an oasis in the desert valley, with fertile soil and plenty of water. It was located along “Incense Road,” the network of routes that facilitated the trading of spices, silk and other luxury items through Arabia, Egypt and India. Al ‘Ula stands on the site of the biblical city of Dedan, but was founded with the ancient North Arabian Kingdom of Lihyan, which ruled from the 5th to 2nd century BC. The older history of the oasis has been divided into several phases. The Dedanite kingdom spans to the seventh and sixth century BC. Dedan is mentioned in the "Harran Inscriptions". In these it is told how Nabonidus the king of Babylonia made a military campaign to northern Arabia in 552 BC or somewhat later, conquering Tayma, Dedan and Yathrib, the old Medina. It is thought that around the turn to the fifth century BC the kingdom became hereditary. The next four hundred years, until around 100 BC, were the time of the Kingdom of Lihyan. The Nabataeans were the lords of the region at least until 106 AD when the Romans conquered their capital Petra. The Nabataeans made Hegra, the modern Mada'in Saleh, their second capital. The power center of the region thus shifted to Hegra some 22 km to the north of Al-`Ula. Prophet Muhammad passed through Al-`Ula in 630 on his campaign to Tabuk. Al-Mabiyat some 20 km away near Mughaira became the next commercial center of the region. It thrived from around 650 until it declined at some time before 1230. In the 13th century the old city of Al-`Ula was built and many stones of the old Dedanite and Lihyanite ruins were reused. Al-`Ula now became the major settlement of the region again until modern times. Between 1901 and 1908 the Ottomans built a railway across the Hejaz in order to link Damascus to Madinah. The railway had a station in both Madain Saleh and Al-‘Ula where a line was built through the western part of Al-Khuraybah, some twelve kilometers to the north of the old medieval town which is believed to be the site of the old Dedanite and Lihyanite town that is still standing there despite of being in bad shape. The most detailed study of the area was made by the French priests, Antonin Jaussen and Savignac, who visited the area three times in the years 1907, 1908 and 1910 respectively. They studied the remains at Dedan and collected a large number of Lihyanite, Minaean, Thamudic and Nabataean inscriptions. Accordingly, it was their work that came to constitute the basis for all further study and research in the history of the area. The first European traveler of modern times to describe the town was Charles Doughty in 1876. Charles Huber was in Al-`Ula in 1881–82. He returned in 1883 accompanied by Julius Euting. In 1968 a team of archaeologists from the University of London investigated some fifteen inscriptions. The vertical sandstone cliffs surrounding the valley ample surfaces for rock art, making the governorate one of the richer petroglyph regions in the Kingdom. Ar-Ruzeiqiah is a mountain located in the southern part of the governorate, with a large petroglyph panel displaying hundreds of images, including depictions of hunting scenes with humans and a variety of animals. Ibex are the most common species, but camels, horses, and other species can also be found. Mount Ikma also has a large façade with scenes, strange symbols, and inscriptions. There are four major municipalities in the Governorate of 'Ula: Al-`Ula, the capital lying to the southwest (population 5,426); Mughira (مغيراء) to the southeast (population 8,952); Abu Raku, to the north (population 2,678); and Al Hajar to the northeast (population 1,707). Al-‘Ula Heritage Village, also known as Ad-Deerah, is the traditional Arabian village where people of the oasis moved some 8 centuries ago and inhabited until the 20th century. It was built on a higher part of the valley in order to be clear from the floods that can occur during the raining season. At its maximum expansion the town contained over 1000 houses that were built adjacent to one another thereby forming a wall around the town to defend the population. On the west of the town, at the bottom of the cliff is the old souq that was renovated. The importance of Al-Ula as an archaeological and historic site leads to the establishment of The Royal Commission for Al-Ula (RCU) in July 2017 which aims at developing and promoting Al-Ula as an international tourism destination. Moreover, the commission develops the plans for heritage conservation and preservation. To promote tourism and gain more attraction, the Royal Commission on Al-‘Ula is training 200 young Saudis on an ambitious project where tourists will explore one of the greatest profusions of cultural treasures to be found anywhere in the world. Recruited from Al-‘Ula region, the 200 young people, all high-school leavers or in their first year as university students, and split 50-50 between boys and girls are in Riyadh, Saudi Arabia being trained in hospitality, learning new languages, studying farming and water technology and swotting up on the cultural, social and natural history of their home region. A resort is planned to be built as early as 2020 and completed in 2023 in Sharaan area. The result will have residental places, a conference venue, a relaxing area and restaurants. On 20 December 2018, the music carnival of “Winter at Tantora” started with a series of different themed weekend events including music, arts, entertainment, and cultural events. The concerts were performed in Maraya concert hall, which was newly constructed for this purpose.The name of the festival 'Tantora' is inspired by a sundial located in the old town of Al-Ula, which has been using by the locals as a marker for the changing of the seasons. On 11 February 2019, Saudi Arabia's Crown Prince Mohammed bin Salman launched the Al-Ula vision which features a resort and nature reserve called Sharaan. The vision also includes the establishment of the Global Fund for the protection and revitalization of the Arabian Leopard. 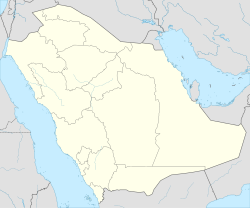 ^ محافظة العلا في السعودية [Al-Ola Governorate in Saudi Arabia]. موسوعة المحيط [The Encyclopedia of the Ocean]. 11 August 2018. ^ a b c العلا.. عروس الجبال.. عاصمة الآثار.. مدينة الأربعين عينًا [Al-ʿUla .. Bride of the mountains .. The capital of monuments .. The city of forty Ain]. Al Madina. 1 December 2013. Archived from the original on 13 January 2018. ^ Chowdhury, Arka Roy (16 April 2018). "Saudi Arabia is planning to open the region of Al-Ula for tourists". The Times of India. Archived from the original on 15 January 2019. ^ Modern Al-Ula at Madainsale.net. ^ Al-Nasif, Abdallah (1981). "Al-'Ula (Saudi Arabia): A Report on a Historical and Archaeological Survey". Bulletin (British Society for Middle Eastern Studies). 8 (1): 30–32. JSTOR 194675. ^ "Al Ula - Arabian Rock Art Heritage". ^ "Al-Ula". Saudi Arabia Tourism Guide. 14 September 2017. ^ "King Salman Appoints Commissions to Develop Al-Ola and Diriyah Gate into Major Tourist Attractions". www.businesswire.com. 2017-07-25. Retrieved 2019-02-11. ^ "الهيئة الملكية لمحافظة العلا - Royal Commission for Al-Ula". twitter.com. Retrieved 2019-02-11. ^ "A new era dawns for Saudi Arabia's ancient cities of Al-Ula". Arab News. 9 April 2018. 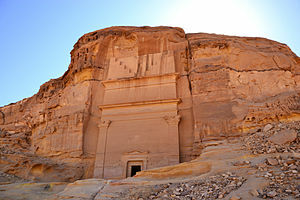 ^ "New drive to showcase the treasures of Saudi Arabia's ancient city of Al-Ula". Arab News. 3 May 2018. ^ "Architect Jean Nouvel talks about design for resort among Al-Ula's rocks". Arab News. 2019-02-11. Retrieved 2019-02-11. ^ Nihal, Mariam (2019-01-16). "Winter at Tantora Festival announced in Al-Ula". Saudigazette. Retrieved 2019-02-05. ^ "About Al-Ula". www.winterattantora.com. Retrieved 2019-02-05. ^ "Launching the Vision for Saudi Arabia's ancient Al-Ula city". Arab News. 2019-02-10. Retrieved 2019-02-11. ^ "'Al Ula Vision... Saudi Arabia gift to world'". Saudigazette. 2019-02-11. Retrieved 2019-02-11. Wikimedia Commons has media related to Al-'Ula.